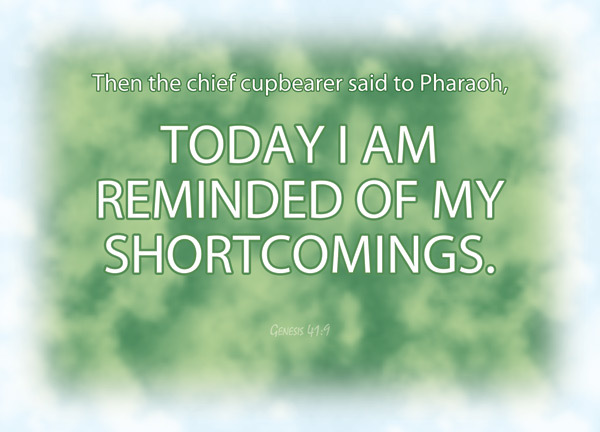 Then the chief cupbearer said to Pharaoh, “Today I am reminded of my shortcomings. We all have shortcomings – certainly, for we are imperfect. We have made mistakes, we have flaws in our characters, we have the occasional undesirable thoughts and motives. Often, when we are down and facing the wall, we recognise our shortcomings easily. But when we are up and enjoying a purple patch in life, it is hard to see them – we forget about them. The main character of our study today is a good example of that. In the time of Joseph, the chief cupbearer of the Pharaoh had a dark and dirty dent in his glorious career as the royal chief cupbearer. Now, this was a position that was very close and intimate with the Pharaoh. After all, what do cupbearers do? They serve the drinks at the king’s table. Because of constant fear of plots and conspiracies, this was a position that must be thoroughly trusted by the king. Sometimes, they even had to taste and test the wines first to guard against poison, before passing the cup to the king. Such an intimate position with the royalty often also comes with great influence. The chief cupbearer, certainly more so than the baker, had a greater opportunity to speak to Pharaoh or ask a favor of him. In today’s study,we will examine the shortcomings of the chief cupbearer – that which he was speaking about, that which he was not speaking about, and that which is similar to ours. This cupbearer had done something to earn the wrath of the Pharaoh, and it really didn’t matter what he did – he might not even have done anything wrong, but it probably wouldn’t take a member of the royalty much to be upset enough to send an official to prison. When he said to Pharaoh, today I am reminded of my shortcomings, it was a humbling act. Speaking to a person of power, that’s what we always do, don’t we? We praise them, and lift them up by humbling ourselves down before them. We don’t know what wrong the chief cupbearer did to earn a go-to-jail card – he might not even have done anything wrong and was imprisoned unfairly – but he humbled himself down before Pharoah. It was probably an incident that Pharaoh didn’t care to hear about or to be reminded about. When the cupbearer said he was reminded of his shortcomings, he likely meant his offense against Pharoah, which led him to jail. Pharaoh probably understood it as that, too. While I believe that was the shortcoming he was referring to, I wonder if he was thinking about another incident at the same time. In prison, he, along with the baker, had dreams, which were interpreted by Joseph. It didn’t matter if their dreams were interpreted or not, actually. Much as the two of them would fret about their dreams, what will happen will still happen – the cupbearer will be released even if he wasn’t informed by Joseph beforehand, and Joseph telling the baker he will be executed wouldn’t save the baker in anyway. Perhaps they fretted just as much after Joseph’s interpretation. The only purpose, or the real purpose of Joseph’s interpretation if the dream was really to let this chief cupbearer know that Joseph had the gift of interpreting dreams. Joseph had asked for him to remember him, but he didn’t. Understandable, wasn’t it? As much as it was amazing, as much as Joseph went the extra mile to show concern for him, as much as Joseph had pleaded his innocence, Joseph wasn’t the cause of his release. Regardless, he was asked to remember Joseph before Pharaoh. Joseph didn’t ask him to think of a way to get him out. Just to remember him – But when all goes well with you, remember me and show me kindness; mention me to Pharaoh and get me out of this prison [Gen 40:14]. He didn’t – The chief cupbearer, however, did not remember Joseph; he forgot him [Genesis 40:23] – for two full years, until he was given a very obvious reminder of the man who had once correctly interpreted his dream – when the Pharaoh had a dream. At this point, he suddenly recalled the young man who had once interpreted his dream accurately. He remembered the favour. It took him a long time, but he eventually repaid the favour – he mentioned about Joseph to Pharaoh and successfully got Joseph out of prison. We all have shortcomings – and like the cupbearer, we sometimes do not recall about it in good times. In bad times we may promise to remember, but as soon as we step out of the darkness, we forget all about it. The day the chief cupbearer was reminded of his shortcomings was the day God worked his miracles, and things changed forever, for Joseph and for the Israelites. What shortcomings are you reminded of today? Are there any sins which you have not accounted to God for? Is there anybody to whom you have wronged? Owed a debt to? Forgotten? More likely than not, there are. And more likely than not, you cannot recall what it is. Let us all be constantly reminded of our own shortcomings, and not be like the cupbearer, who only remembers it two years later. And as we are reminded, let us strive to better ourselves instead of persecuting ourselves.